1) READ ENTIRE INSTRUCTIONS BEFORE PROCEEDING. 4) MAKE SURE ALL TOOLS ARE AVAILABLE FOR INSTALL. 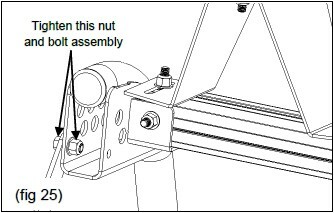 5) A FULL ASSEMBLY IS SHOWN ON PAGE 6 FOR CLARIFICATION OF ALL ASSEMBLED PARTS. 4) REPEAT STEPS 1-3 FOR OTHER SIDE. 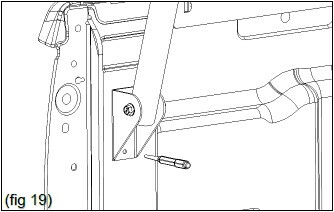 3) INSTALL ASSEMBLY ONTO TRUCK. (HAVING A SECOND PERSON STABALIZE THE ASSEMBLY MAKES THIS JOB MUCH EASIER). 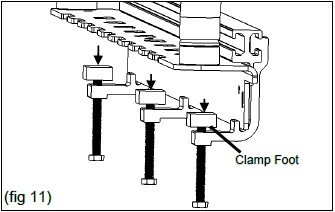 4) INSTALL CLAMP FOOT ON ALL 3 RAIL CLAMPS. 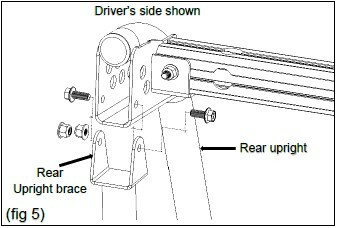 (FIG 11) TIGHTEN CLAMPS SO THAT THE RAIL STAYS IN PLACE ON THE TRUCK BUT CAN STILL BE MOVED FORWARD AND BACKWARDS. 5) REPEAT FOR OTHER SIDE. NOTE: SOME BEDLINERS MAY NEED TO BE MODIFIED. 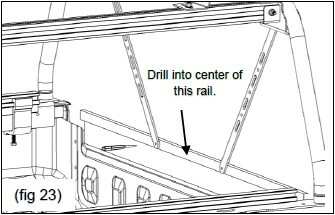 CUTTING BEDLINER IN AREA OF RAIL CLAMP MAY BE NECESSARY. 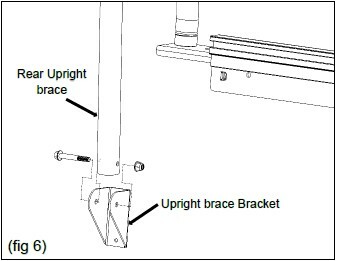 3) INSTALL TWO T-BOLTS AND M8 NUTS INTO EACH OF THE (4) CROSS BAR BRACKETS (FIG 13) 5) SLIDE (4) T-BOLTS INTO THE TOP RAIL USING THE ACCESS HOLES. REPEAT FOR OTHER SIDE. 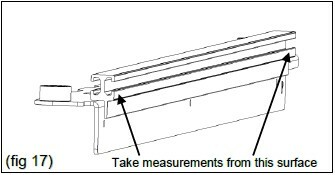 3) USING A TAPE MEASURE ADJUST THE DISTANCE ACCORDINGLY. 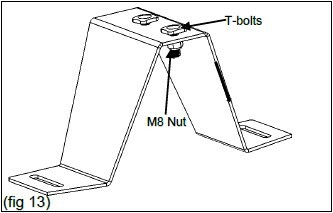 TIGHTEN THE (8) M8 NUTS THAT HOLD THE CROSS BAR IN PLACE. DOUBLE CHECK YOUR WORK AS YOU WILL BE DRILLING HOLES IN THE NEXT FEW STEPS!! 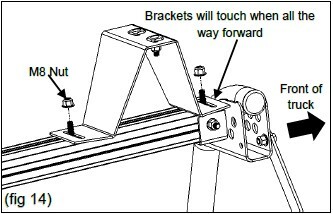 2) SWING THE BRACKET OUT OF THE WAY AND USING A POWER DRILL AND 1/8 DRILL, DRILL THROUGH THE SHEET METAL. FOLLOW WITH THE INCLUDED 25/64 DRILL. BE CAREFULL NOT TO DRILL INTO THE LIGHT OR WIRING BEHIND THE SHEET METAL. 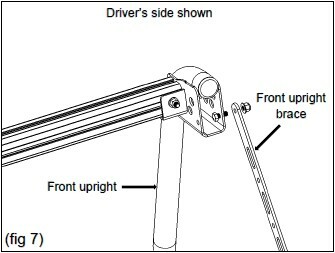 6) REINSTALL AND TIGHTEN ALL BOLTS IN REAR UPRIGHT BRACE BRACKET TO 18 FT-LB. WARNING! RIVET NUTS NOT PROPERLY COLLAPSED WILL NOT HOLD SECURELY TO SHEET METAL. 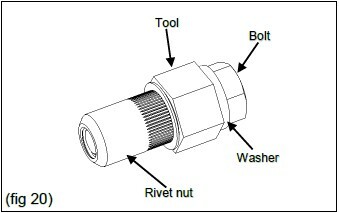 2) INSTALL RIVET NUTS THE SAME WAY AS YOU DID IN PREVIOUS STEP. 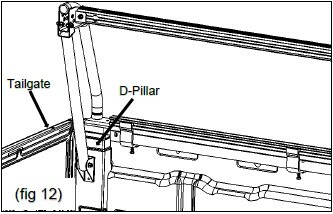 NOTE: IT IS NORMAL FOR THE FRONT SUPPORT BRACKETS TO BEND SLIGHTLY. 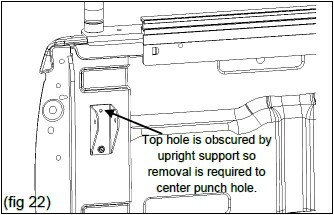 NOTE: BE CAREFULL NOT TO PUSH ON THE DRILL SO HARD AS TO DRILL INTO THE BACK OF THE TRUCK CAB. 4) SLIDE THE CROSSBAR BACK INTO THE REARWARD POSITION. When using Leitner Designs carriers and accessories, the user must understand the precautions. 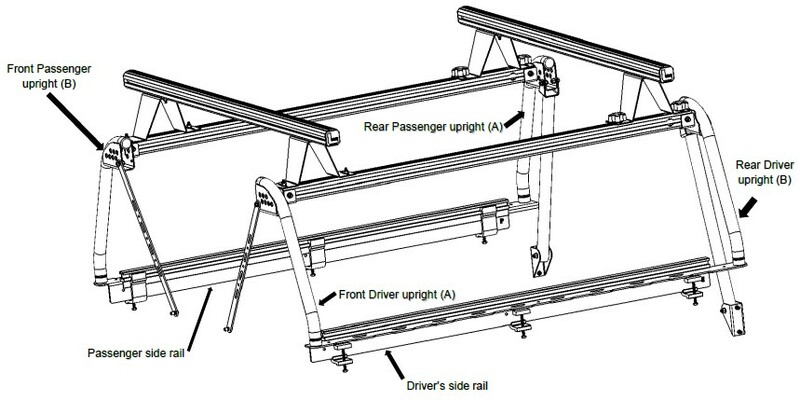 The points listed below will assist you in using the rack system and will encourage safety.  For quality fits and safety, use only the recommended rack or accessories. 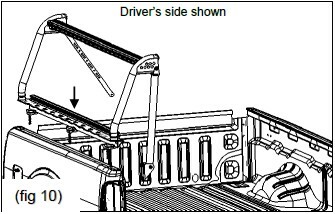 Do not assume a rack will fit, always check the current Fit Guide when obtaining a new vehicle.  The maximum load is not to be exceeded. (250# off road - 500# on road). 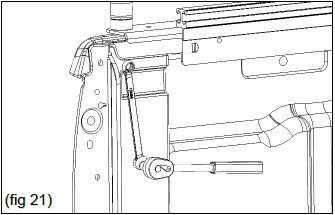 However, this limit is always subordinate to the maximum load recommended by the manufacturer of the vehicle itself. It is always the lower maximum recommended load that applies. 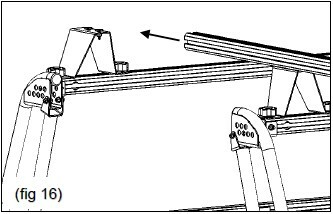 Max truck load = load carrier weight any fitted carrier accessories the weight of the load itself. 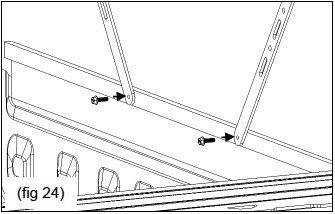  Make sure all knobs, bolts, screws, straps, and locks are firmly attached, tightened and locked before every trip. 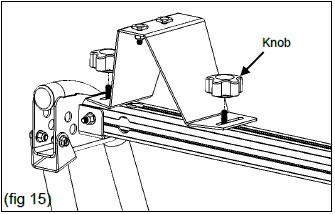 Knobs, bolts, screws, straps and locks must be periodically inspected for signs of wear, corrosion, and fatigue. Check your load at stops during the trip to ensure continued fastening security. 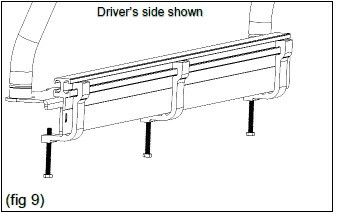  Check local and state laws governing projection of objects beyond the perimeter of a vehicle. 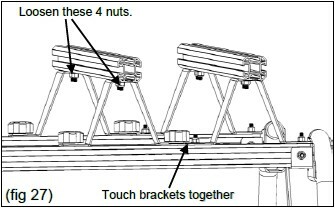 Be aware of the width and height of your cargo since low clearance branches, bridges, and parking garages can affect the load. 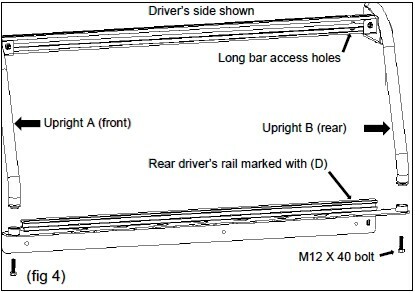 All cargo will affect the vehicle’s driving behavior. Never drive with any lock, knob or rack in an open or unlocked position. 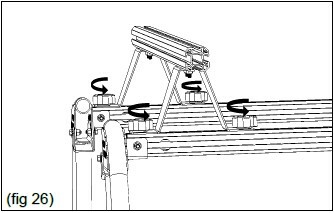 All long loads such as, but not limited to, sailboards, surfboards, kayaks, canoes, and lumber must be tied down front and rear to the bumpers or tow hooks of the vehicle. 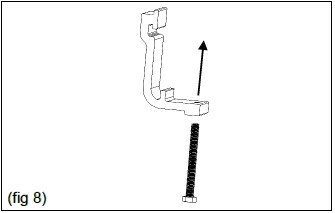  All locks must be turned and moved periodically to ensure smooth operation. Use graphite or dry lubricant to help this. 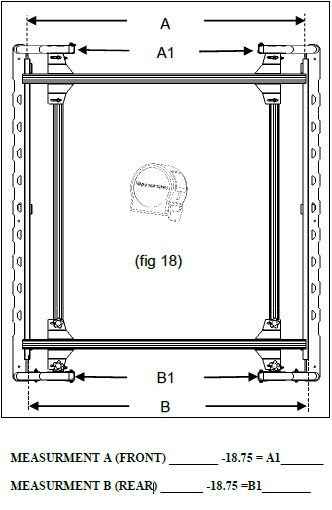 Leitner designs locks are designed to deter vandalism and theft but should not be considered theft proof. Remove valuable gear if your vehicle is unattended for an extended period. Place at least one key in the glove compartment.  For safety to your vehicle and rack system, obey all posted speed limits and traffic cautions. Adapt your speed to the conditions of the road and the load being carried. 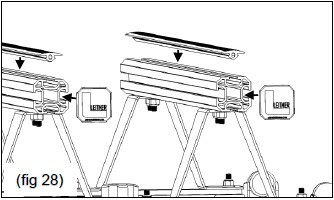  Do not use Leitner Designs load carriers and accessories for purposes other than those for which they were designed. Do not exceed their carrying capacity. Failure to follow these guidelines or the product’s instructions will void the warranty.  Consult with your Leitner Designs dealer if you have any questions regarding the operations and limits of Thule products. Review all instructions and warranty information carefully.